In fact, in the earliest existing written description of this bizarre creature, Pennsylvania zoologist Samuel Garman wrote in 1884, “its appearance in the forward portion of the body, particularly in the head, brings vividly to mind the triangular heads, deep-cleft mouths, and fierce looks of many of our most dreaded snakes.” The shark’s discovery led Garman to suggest that people should not dismiss too easily the possibility that a “serpent-like monster of the oceans” might actually exist. What makes these sharks so fierce are the 300 teeth that are arranged in 25 diagonal rows along its gaping mouth. The teeth all face backward, making it impossible for prey to back out of the shark’s jaws once snagged. Examinations of stomach contents suggest that squid and other cephalopods make up more than half the frilled shark diet. But scientists know almost nothing about their hunting habits. There is one problem, however, in blaming these serpentine predators for supposed sea serpent sightings. 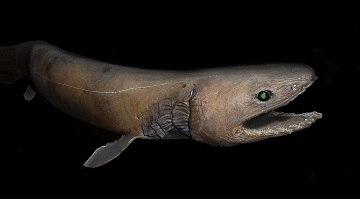 Although frilled sharks can grow as long as 6 feet, they more typically reach only 3 to 5 feet long, hardly the massive monster that superstitious sailors might fear. Are frilled sharks responsible for myths about sea serpents, or is that possibility a myth itself?